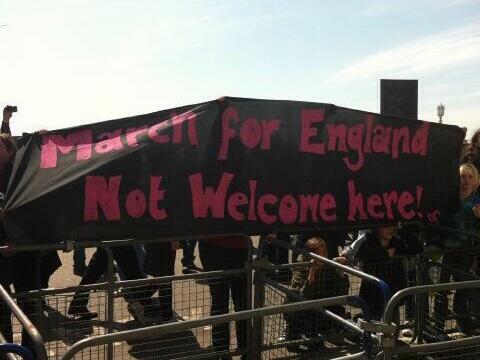 This was just one of the chants that rang out along Brighton seafront and around the Old Steine on Sunday 21 April 2013 as a miserable group of no more than 200 racists and fascists were comprehensively rejected by thousands of locals standing together, united in agreement that “from the Downs to the sea, Brighton will be fascist free”. In addition to the huge seafront crowd – who were more loosely held between lines of police, pens and steel fencing on the Upper Promenade – hundreds more protesters were trapped on the other side of a police kettle in Old Steine, with yet more caught behind street barricades erected at the south end of every road from there through to Middle Street. It was heartening to see anti-racist protesters in every direction as far as the horizon, but there were also totally over-the-top lines of police: with horses, dogs, countless vans and those very offensive barricades. 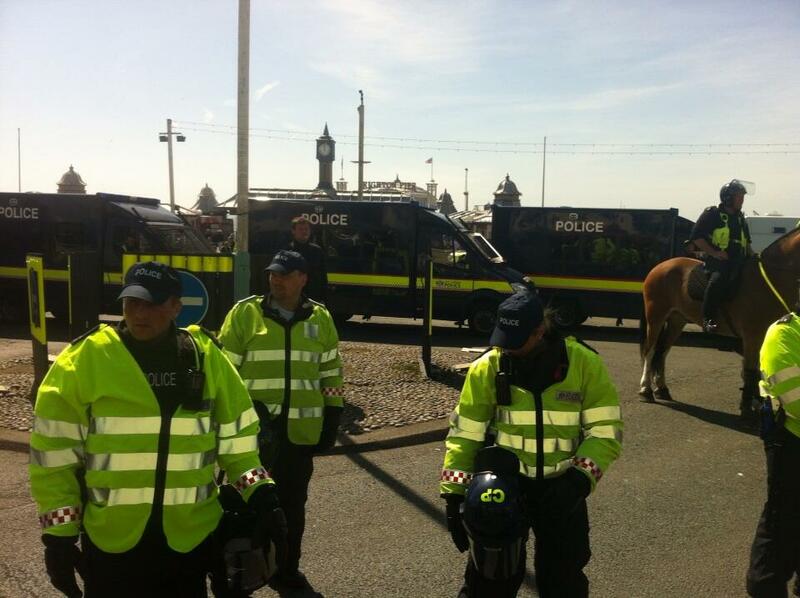 Access to the Palace Pier and seafront attractions was allowed only to racists, fascists and their police escorts. Local protesters and traders were equally livid on the first warm, sunny Sunday of the year. 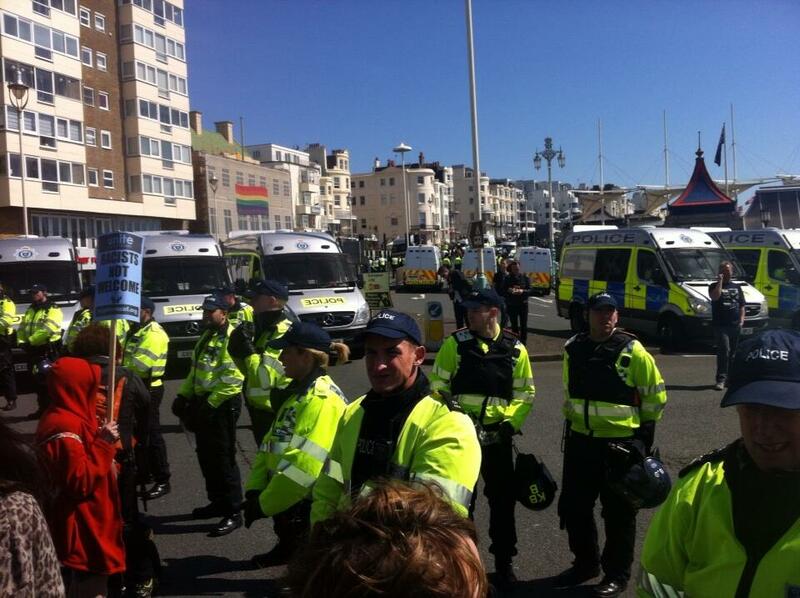 A wall of police greeted local anti-racist protesters on arrival at Brighton seafront. Protesters numbered thousands. The racists and fascists were a couple of hundred if that, bussed in from outside, but protected with a police guard reported to number 700. It’s not yet clear who authorised this massive police operation, which was more dramatic than anything locals can remember, even from the 1984 IRA bombing of Tory party conference. Many are wondering about the new Tory Police & Crime Commissioner, whose previous experience was as a school governor at the elite Roedean public school. On Sunday protesters were left asking: how many police officers does it take to protect a racist? 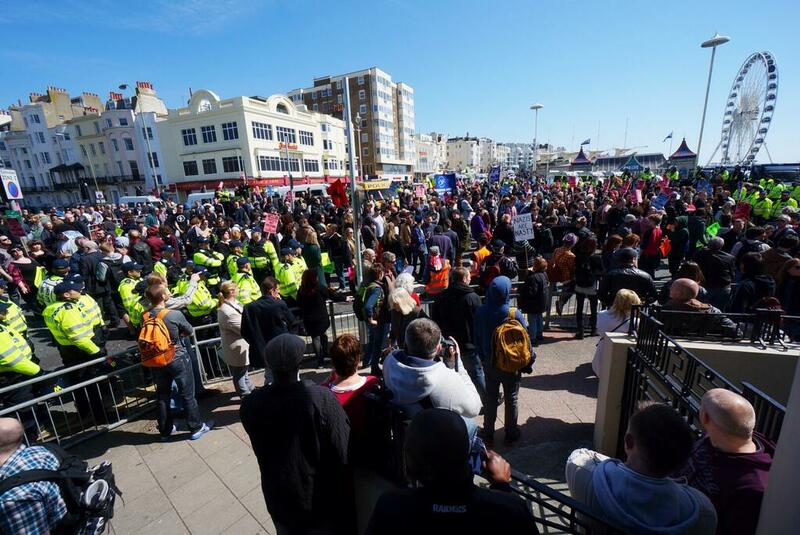 Central Brighton seafront, covering Brighton’s leading tourist attractions, was turned into a police state so that racists could walk a few hundred metres from the Palace Pier to Middle Street and back again. Someone has to explain why local residents, united in opposition to all aspects of this operation, must now pay for this abhorrence. 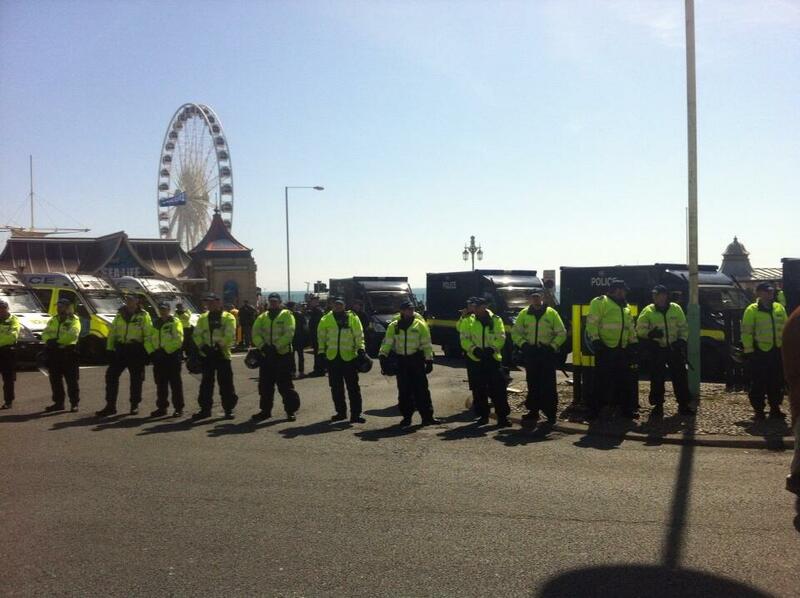 Street barricades, erected and staffed by police, blocked access to Brighton seafront. Shops and businesses in the wrong areas had been forcibly closed. Hotels had locked their doors to non-residents, while residents had to prove their identity to security guards. All this on the false premise of violence last year – when the very few confirmed incidents were police hitting a local union official and pepper-spraying protesters standing their ground against racists, plus a litterbin set on fire by youths late in the day. Thus infringements of civil liberties in 2012 have been manipulated to excuse the curtailment of local protest on a massive scale in 2013. This is a serious and chilling development. 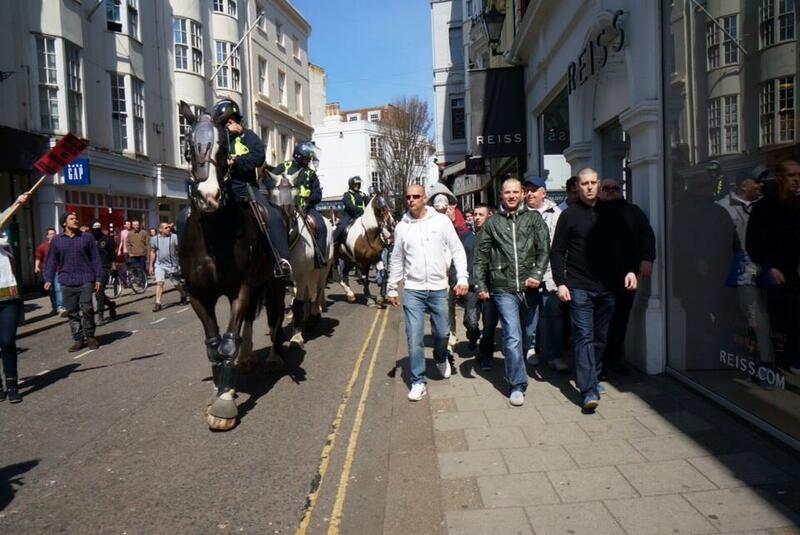 One small group of racists was given a police horseguard during an afternoon tour of the streets of Brighton. Funny how they got to walk where they wanted, while most protesters were kept in a kettle at the Old Steine or had their paths blocked at every turn. Police allowing racists to roam led to flashpoints. 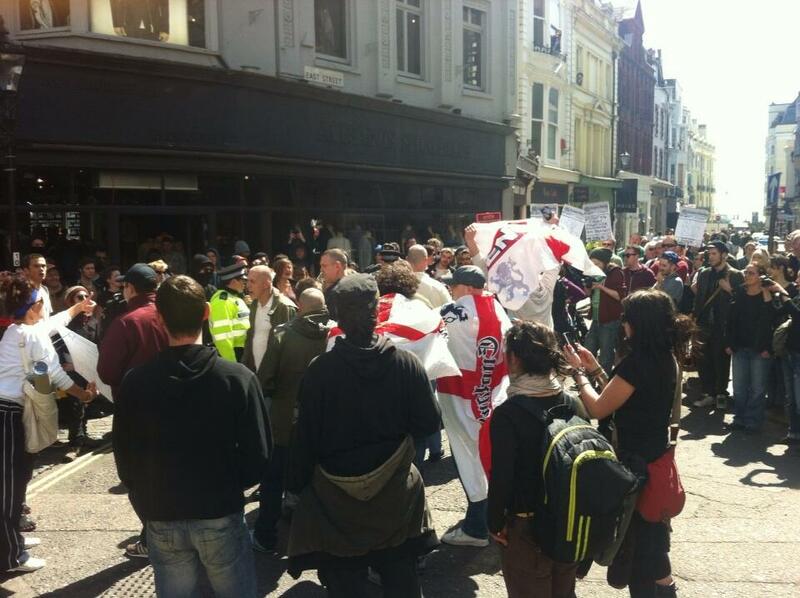 In East Street, locals and street-traders simply asked why racists didn’t self-apply their policy to “go home”. 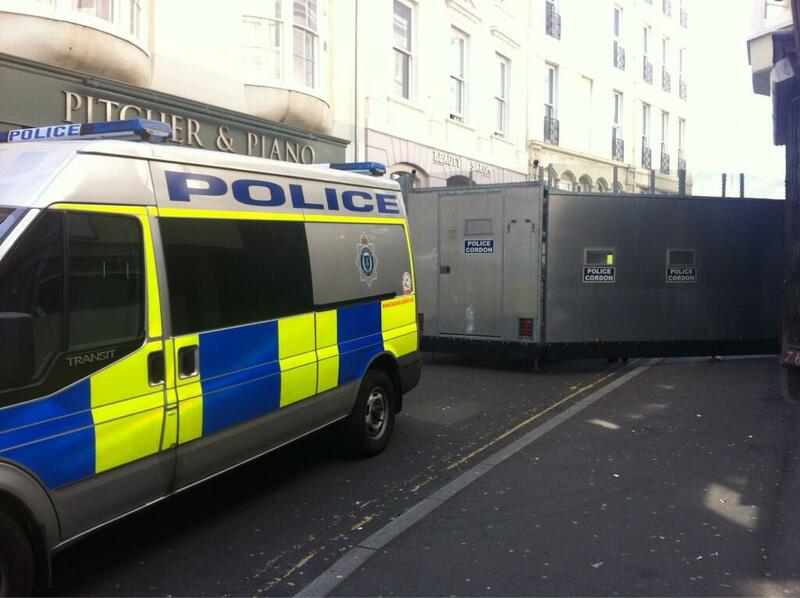 Local rag, The Argus, typically exaggerated such incidents and hyped-up arrests, while initially downplaying the military-style police presence on Brighton’s streets. A more balanced report was given by ITV News yet there has been no mainstream coverage of the 9 photojournalists who were stopped and searched under anti-terror laws before even reaching Brighton centre. Although seen by many, the video of this damaging incident was taken down from You-tube on Monday 22 April. 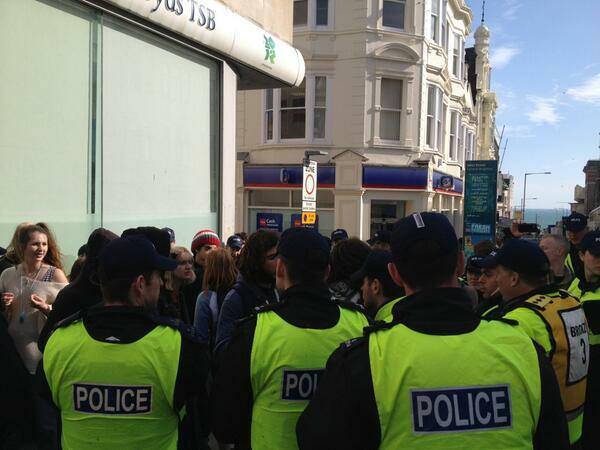 Police appeared keen to detain anti-racist protesters, such as this group kettled in West Street, who were seemingly held so that racists and fascists could enjoy a drink in Molly Malones – a pub everyone should boycott in future. Questions must also be asked of the companies that transported the racists into Brighton. We hear that one was Sussex Coaches. Use info@sussex-coaches.co.uk to let them know what you think of their business plan. 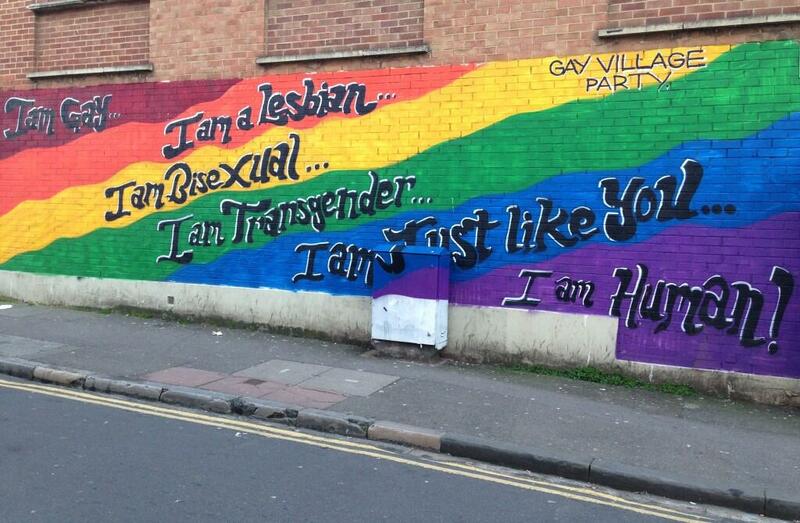 “I am just like you – I am human” Brighton’s street art sums up the town’s reputation for celebrating diversity, demonstrating the benefits of a multi-cultural society and giving a warm welcome to everyone except racists and fascists. Whether collectively or individually, “Whose streets? Our Streets!” was roared by thousands of protesters at racists throughout the day, stressing the unity of locals in repelling racists from our towns. 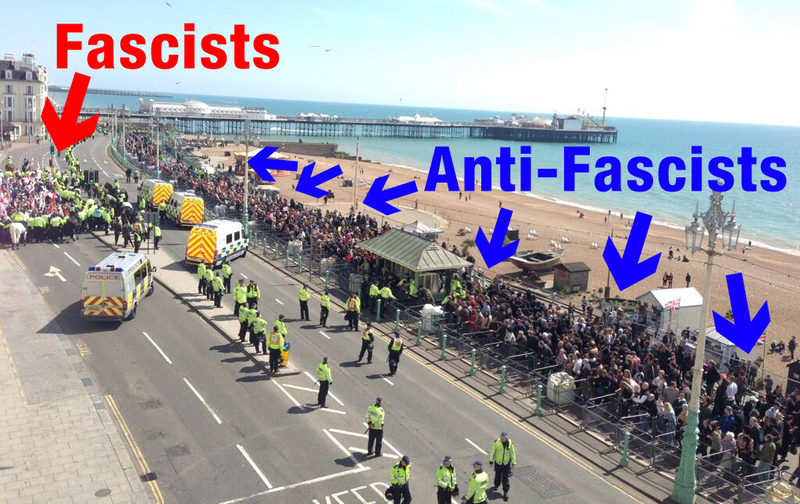 Once again it is clear that racists and fascists are not welcome in Brighton & Hove. Local people want to know why their towns are allowed to be the target for this annual march by a small group with no known links to the area. The racists marched for nothing, now local people are being told that we must pay a price: either in terms of restrictions on future protest or an increase to our Council Tax. We don’t trust two Tory MPs with dubious records to resolve these issues. Do you? 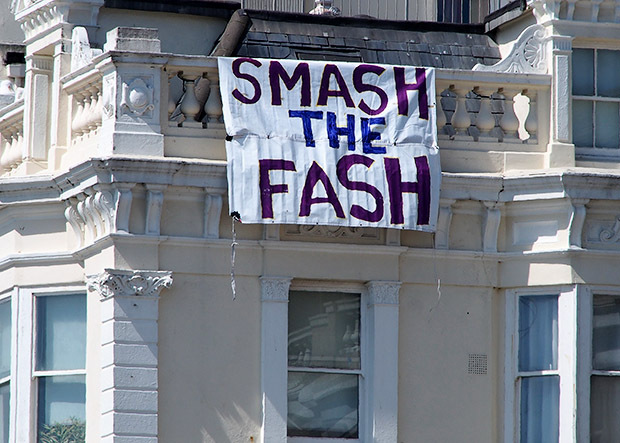 For a generation or more the Left has been reluctant to apply the label “fascist” to the far right and racists, for fear of de-basing the seriousness of the fascist threat. This reluctance has been swept away on the tide of Coalition divide and rule tactics, as this government exploits hate, prejudice and fear arising from the world economic crisis, to force through its ideological crusade to reverse the welfare state. Combined with the rise of neo-fascist groups, such as Golden Dawn in Greece, this has engendered both a sense of foreboding but also of determination. Last Sunday Brighton & Hove demonstrated that people standing united together have tremendous power. Late in the afternoon around 1,000 anti-racists needed no police protection on an impromptu march from the Old Steine to the railway station. Leave the racists to the people: we can deal with them just through weight of numbers – we don’t need any armed police guard. Unity is strength! For we are the many – they are the few.